Musicale | From the Seasonally Occupied Territories . . . When I first heard a couple weeks ago that there’d be a musicale at the Pit Stop on January 14, I couldn’t wait. But as the date drew closer, my enthusiasm drooped. I didn’t want to go. I was afraid of what I’d find there. The online buzz was considerable. I was afraid it would be mobbed, or “a scene,” or a mob scene — something a long way from the musicale I wanted to be part of. I went anyway, and boy, am I glad. 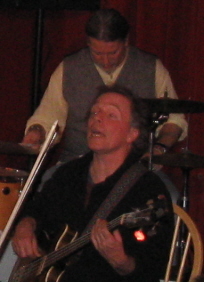 Paul Thurlow sings; behind him is Brian Weiland on percussion. First, a word about musicales. The pronunciation is closer to “musical” than “musical,” and they have a long history on Martha’s Vineyard — and probably, by other names, in many other places. 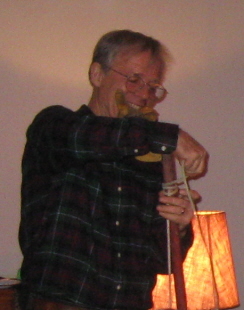 Musicales are friends, neighbors, and kinfolk gathering in one another’s living rooms to play music and sing together. Before recordings and radio, if you wanted to hear music you had to make it yourself, and that’s what people did. I first learned about the musicales as a volunteer at Wintertide Coffeehouse in the mid-1980s. Wintertide in those days happened on occasional winter weekends, in whatever free or cheap space it could cadge. 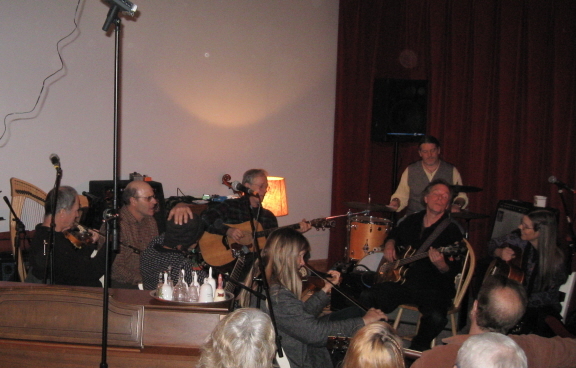 People often called it a successor to “the old West Tisbury musicales.” As Wintertide grew, attracting more off-island performers and eventually becoming a year-round thing, it also inspired a fair amount of grumbling. As a newcomer, I thought Wintertide was unmitigated wonderful. I didn’t understand the grumbling. I didn’t understand what was being lost in the increasing emphasis on off-island performers, on “professionalism” — the kind that comes at the expense of home-grown amateurs who make their livings doing something else. Well, we’ve lost a lot more since then, including Wintertide, so when Todd Follansbee put the word out that there’d be a musicale at the Pit Stop on January 14, my expectations were high, and so were my fears that they couldn’t possibly be met. So the Pit Stop lent itself well to the musicale format: a bunch of musicians gathered in a circle, the listeners grouped around them, with the line between performers and audience blurry and sometimes nonexistent. A song would be suggested, a key settled on, and off they’d go, trading licks and leads. When audience members knew the words, which we often did, we’d sing along. The harmonies on “The Weight” and “I Shall Be Released” filled the room like mist and sunlight. We laughed a lot — seriously, people, when was the last time you heard a song like Peter Huntington’s “Mouse Farts” on either Pandora or the radio? Tom Hodgson, musician extraordinaire who masquerades as a sign painter and an acute observer of the natural world, doubled on guitar and washtub bass. The latter provided suspense and hilarity — for want of a washer would the bass be lost? — before Tom won the cooperation of his persnickety instrument. We were reminded that humans — which would include us — can make music with just about anything. 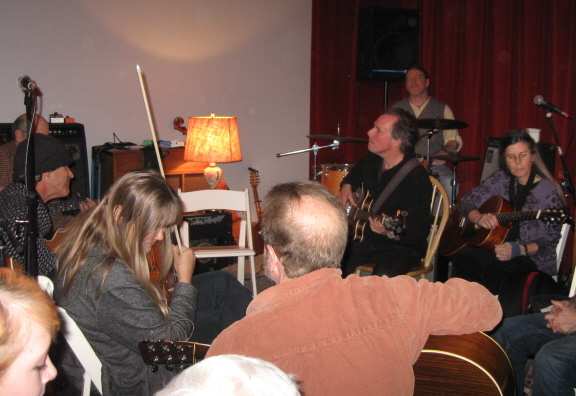 And that music is too important to be left to the pros: last night’s performers included, along with Tom the sign painter, a contractor, a carpenter, a couple of teachers, and a landscaper who doubles as a Tisbury selectman. Several of the musicians were mainstays of musicales past, and another musicale veteran, island native John Mayhew, who died last Wednesday, age 91, was very much there in spirit. The 1929 Martin guitar that he owned in the 1930s was there in person, as were his three children and three musical granddaughters. As the evening drew to a close, we went reluctantly into the cold and windy night, all hoping and even expecting that there would be a reprise in the not-too-distant future. This entry was posted in music, public life and tagged Oak Bluffs, Pit Stop, year-rounders. Bookmark the permalink. SUSANNA – may I read this next Sunday night at Cynthia’s ? It’s a beautiful piece……. Now I’m sorry I wasn’t there. One of the joys of Austin’s South by Southwest music festival, once you get past the festival, the fringe festivals and the anti-festivals (“South by So What”? ), are the living-room and backyard-barn get-togethers. I’m usually levitating as I leave. Harmonizing to “The Weight” always reminds me of the coffeehouse we had in the basement of an administration building when I was at Georgetown. When the scheduled performances ended, several of us would drift to the stairwell at one end of the old stone building. Acoustics in that stairwell were celestial, extraordinary — insert your own superlative here. “The Weight,” with half a dozen voices, male and female; a couple of guitars and a stand-up bass — you could feel the harmonies reaching up the stairwell all the way to the fourth floor. Good stuff, wish I had been around for this one.